CHROME BUMPERS & Motors for H.O. SLOT CARS! Also, if you're needing drivers, wings, heads, scoops and other miscellaneous body parts, be sure to click the on the left. 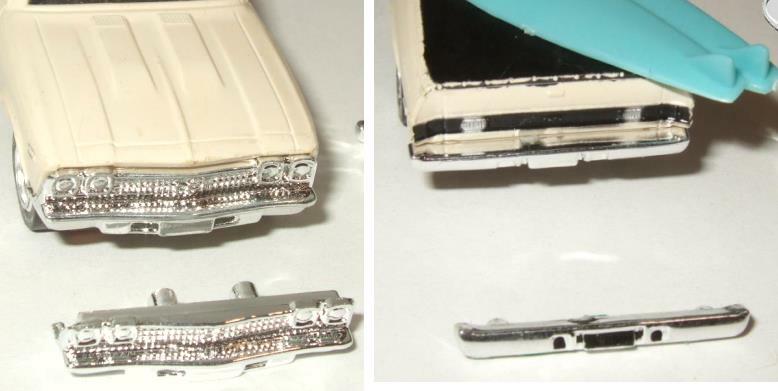 1351-F '63 Galaxie Convertible Front Bumper-$5 each piece! 1354-F;-R '63 Falcon Front and Rear Bumpers-$5 each piece! 1356-R; '63 Corvette Rear Bumpers-$5 each piece! 1358-F/R Jag XKE Front Bumpers-$5 ea. 1365-R Hot Rod Roll Bar - $5 ea. 1369-F; Lincoln Front Bumpers - $5 each piece! 1371-F;-R Mustang Convertible Front & Rear Bumpers-$5 each piece! 1380-R; Mako Shark Rear Bumpers-$5 each piece! 1386-R '67 XL500 Rear Bumpers-$5 each piece! 1389-F;-R Cougar Front or Rear Bumpers - $5 ea. 1402-F; Firebird Front Bumpers-$5 each piece! 1760-R Nomad Rear Bumper - $5 each piece! 1762-R Roadrunner Rear Bumpers-$5 each piece! 1774-F;-R DATSUN 240-Z Front & Rear Bumpers-$5 each piece! 1968-F '57 Vette Front Bumper -$5 each piece!